Whether you are an anatomical pathologist, clinical pathologist general or indeed a veterinary pathologist, it’s important work, and requires consistent methods compliant with standards such as CAP to produce accurate, timely results every time. And you want a data management system that helps you, rather than hinders, making your processes simple, streamlined and convenient while offering full functionality, reporting capabilities and process control with secure, role-based access. Your LabLynx webLIMS for Pathology solution is all of that and much more. The main component of the LabLynx LIMS Solution for the Pathology Lab is webLIMS. WebLIMS is used in top forensic laboratories as a complete case management solution, including all aspects from investigator to ME, TOX, agency management, evidence, histology, radiography, photography, etc., in addition to its pathology module. So you’ll be using the very best in pathology solutions available. Users have role-based secure access to only their areas of any given case, including delivery and pickup, with full COC tracking. Barcoded labels, auto-filled fields and automatically-generated unique specimen IDs all help minimize transcription errors and maintain peak accuracy, along with easy interface with voice transcription apps. And you can achieve the best accuracy and speed possible, meeting all CLIA HITECH, CAP and other applicable standards and more by interfacing your instruments directly with webLIMS. Your LabLynx solution comes with an included Report Builder, as well as a standard selection of reports, so you can meet all of your reporting requirements. You also get Inventory Management, Corrective Action, Instrument Management, the ability to upload files of any kind and associate them with a case, and much more. And its extensive user-configurability means it is easily modified and extended to meet growing demands for decades – without the need for costly additional development. Your LabLynx Pathology LIMS solution includes an extensive range of features and functions to give you everything you need, no matter the testing requirements. Automatically assign assays based on specimen type or any other criterion – complete with specific ranges and flags for high/low values included in your report automatically. Upload images or other items to be associated with the case. Add as many notes as you want – use pre-set notes whenever appropriate, quickly and easily. 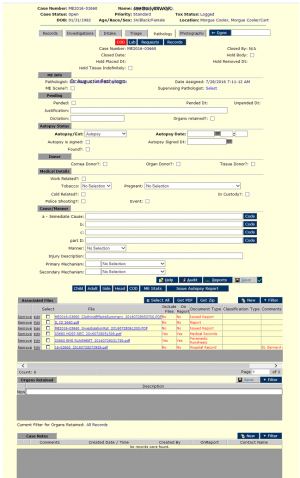 Contact Management – Manage all agencies, facilities, suppliers etc. Scalability – add functionality, add volume. No limits.